This Web site is for anyone who is interested in the sport of surfing. 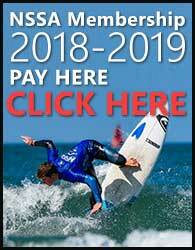 We've organized the National Scholastic Surfing Association into categories on the top of the page so you can jump easily into areas of interest. Many areas of the site will be updated on a regular basis. So, make sure to visit us as often as you like. 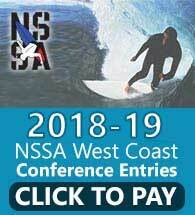 To view the 2019 NSSA Championship Dates, click here. Click here to view the 2018 NSSA Surfer of the Week archives. Click here to view the 2017 NSSA Surfer of the Week archives. Click here to view the 2016 NSSA Surfer of the Week archives. Click here to view the 2015 NSSA Surfer of the Week archives. Click here to view the 2014 NSSA Surfer of the Week archives. Click here to view the 2013 NSSA Surfer of the Week archives. Click here to view the 2012 NSSA Surfer of the Week archives. 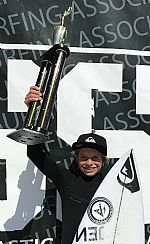 Click here to view the 2011 NSSA Surfer of the Week archives. Click here to view the 2010 NSSA Surfer of the Week archives. Click here to view the 2009 NSSA Surfer of the Week archives. Click here to view the 2008 NSSA Surfer of the Week archives. 2019 EAST COAST REGIONAL CHAMPIONSHIP RESULTS! SOUTHWEST OPEN EVENT 9 RESULTS AT OCEANSIDE PIER! 2019 INTERSCHOLASTIC STATE CHAMPIONSHIP RESULTS! FINAL RESULTS OF THE SOUTHWEST OPEN EVENT 8 AT SALT CREEK! 2018/19 WEST COAST COLLEGE SEASON FINALE AT STEAMER LANE! RESULTS ARE IN! 2018 EAST COAST REGIONAL CHAMPIONSHIP RESULTS! 2017 WEST COAST REGIONAL CHAMPIONSHIPS RESULTS! 2017 NSSA EAST COAST CHAMPIONSHIPS RESULTS! Check out who was shralping on our Right Coast! CARISSA MOORE INTERVIEW: What's up with our 9 time National Champ!